The Dream Team bonded together to face two teams, Westchester Chess School and the Stamford Youth All-Stars on this Saturday! The 7 Stamford Youth All-Stars players struggled against the Dream Team. In the first round, Benjamin Walker, Jason Lessing, Matthew Weinstock, Sean Thomas, and Emilie Wasserman all won their games! 2 points were given to Stamford by Bevy Rutledge and Brett Lubliner’s check mates, making the score for the round 5-2. In round 2 Samuel Forfang and Brett Lubliner won their games for Stamford. Weinstock, Thomas, Aalok Bhattacharya, and Vrishak Duriseti gained 4 points for the Dream Team! Emilie Wasserman and John Ryan-Dowling drew giving both teams half a point. The Dream Team ended up winning against the Stamford Youth All-Stars 9.5-4.5. 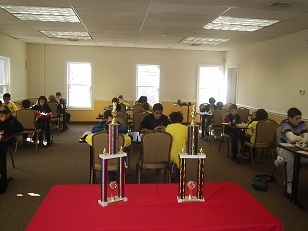 Meanwhile, the other half of the Dream Team had their work cut out for them against the strong Westchester Chess School. In Round 1 Zachary Filler, Dominick McConnell, Bilal Memon, and Rhythm Satav won their games to give the Dream Team 4 points. However, Leo van Osdol, Ricky Major, Jack Gomez, and Karl Elmore won another 4 points for Westchester’s team! The tie from the first round put a lot of pressure on the second round and everyone gave it their all. 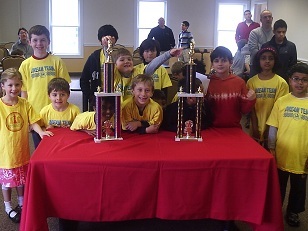 Karl Elmore and Ricky Major both won their games, while Jake Seidman and Jack Gomez tied against Dream Teamers Cyrus Pearson and Benjamin Walker giving Westchester Chess school 3 points. Along with those two ties, Filler, McConnell, Memon, and Dalton Brown all won their games leaving the Dream Team with 5 points winning the round and the match against Westchester with a final score of 9-7! Well done everyone!